A precision genetic analysis has yielded a surprising result, a network of neurons control breathing with other specifically functioned neuronal networks within the vagus nerve. Among these function-specific network of neurons, two types are dedicated to two specific respiratory functions. The data findings suggest new ways of treating and diagnosing clinical conditions related to the vagus nerve. The opensource study is published in Cell. The tresearchers from Harvard Medical School explain that they have effectively deconstructed the vagus nerve, a key connection between body and brain. This important connection controls not only breathing but also heart rate, feeding behavioor and responses to illness. Using genetic tools to activate these two neuron types with light, the scientists found that stimulating one neuron type caused mice to stop breathing completely, trapping them in a state of exhalation. Activating the second neuron type made the mice take rapid, shallow breaths, as if they had inhaled some kind of irritant to their lungs, hinting at a pulmonary defense mechanism. The current study showed that because the vagus nerve is not one uniform structure, cutting or stimulating all of it to treat certain conditions may not be the best choice. Vagal nerve stimulation is nevertheless widely used clinically to treat a range of conditions, from epilepsy to mood to obesity. Targeting particular subsets of neural networks precisely within the vagus nerve electrically or pharmacologically may bypass clinical side effects. The team state that it’s exciting to think that one type of neuron might be controlling nausea, another might be controlling feeding behaviour, another one heart rate, another one breathing. For the mouse model to stop breathing when some two hundred neurons were activated is a huge effect from a very small number of neurons. In the early 20th century the vagus nerve was at the forefront of physiological research because of its importance and accessibility, the team state. At a cellular and molecular level, no one really knows how the vagus nerve detects different physiological stimuli, from the stretch of the stomach after a meal to toxins that induce nausea to changes in blood pressure. In mice, each vagus nerve contains about 2,500 sensory neurons, a small number for a structure that innervates the heart, lung, stomach and intestine and controls different functions in these different organs. In the current study the team first had to combine anatomic and genetic methods by screening the vagus nerve for sensory receptors. In the vagus nerve the researchers ranked the expression of G-protein-coupled receptors (GPCRs), known for their involvement in sensing and sending messages. The team found some previously reported receptors and discovered others in small subsets of vagal sensory neurons. Different GPCRs showed up on different neurons, allowing the scientists to parse specific cell types that might direct particular vagus nerve functions. The team hypothesized that the various physiological functions of the vagus nerve were being regulated by different smaller networks within these 2,500 neurons. The team found intermingled populations of neurons containing different receptors and theorised that they might be doing different things. The researchers then got a genetic foothold on this sensory system by labeling GPCRs in mice. The team did this by engineering them to produce channelrhodopsin which allowed the researchers to use light to manipulate the cells’ function, a technique known as optogenetics, and study the neurons sorted by different GPCRs. The data findings showed that two subpopulations of vagal neuron netwoks sent dense fiber projections into the lungs of the mice, but in different ways. One type fanned out into candelabra-like endings on the surface that lines the airways. The other type terminated in smaller endings farther away from the main airways, inside tiny air sacs called the alveolar space. The scientists also saw similarly divergent patterns in the brainstem. The team state that only were these neurons molecularly distinct, based on the GPCRs, but they also had very different anatomical projection patterns. When the scientists activated all the sensory neurons within the vagus nerve, not just the two networks, they saw strong effects on heart rate and gastric pressure. But activating only the neurons that made the mice stop breathing didn’t change heart rhythm or gastric pressure meaning they are specific to respiration control. The results support the idea that certain neurons are dedicated to particular functions, which could have implications for therapies to treat asthma, epilepsy, heart dysfunction and obesity. But first, many other questions need to be answered state the team. What are the neurons responding to? How are they detecting these stimuli? Is it efficient to stimulate all sensory neurons within the vagus nerve at once? The team now plan to map the neuronal networks which control feeding behaviour, nausea, and heart rate. Breathing is essential for survival and under precise neural control. The vagus nerve is a major conduit between lung and brain required for normal respiration. Here, we identify two populations of mouse vagus nerve afferents (P2ry1, Npy2r), each a few hundred neurons, that exert powerful and opposing effects on breathing. Genetically guided anatomical mapping revealed that these neurons densely innervate the lung and send long-range projections to different brainstem targets. Npy2r neurons are largely slow-conducting C fibers, while P2ry1 neurons are largely fast-conducting A fibers that contact pulmonary endocrine cells (neuroepithelial bodies). 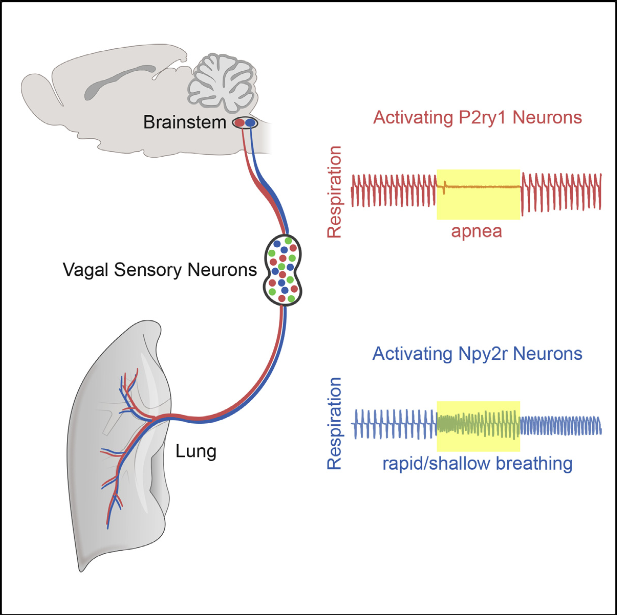 Optogenetic stimulation of P2ry1 neurons acutely silences respiration, trapping animals in exhalation, while stimulating Npy2r neurons causes rapid, shallow breathing. Activating P2ry1 neurons did not impact heart rate or gastric pressure, other autonomic functions under vagal control. Thus, the vagus nerve contains intermingled sensory neurons constituting genetically definable labeled lines with different anatomical connections and physiological roles. Vagal Sensory Neuron Subtypes that Differentially Control Breathing. Liberles et al 2015. Its really awesome they managed to discover this!